During my term as President of the WVU Game Developers Club from 2015 – 2017, I struggled to find game developers in the state of West Virginia and because of that, I wanted to put together this short post to help others who are interested or may be looking for networking opportunities. The following list includes registered businesses within the state of West Virginia, along with a few groups that aren’t registered yet but do all their work within the state. As seen on the map above, I have identified six “studios” within the state (several new ones are not included there but are explained later). Below I will highlight each one individually, along with general info about them and games they have developed and/or published. 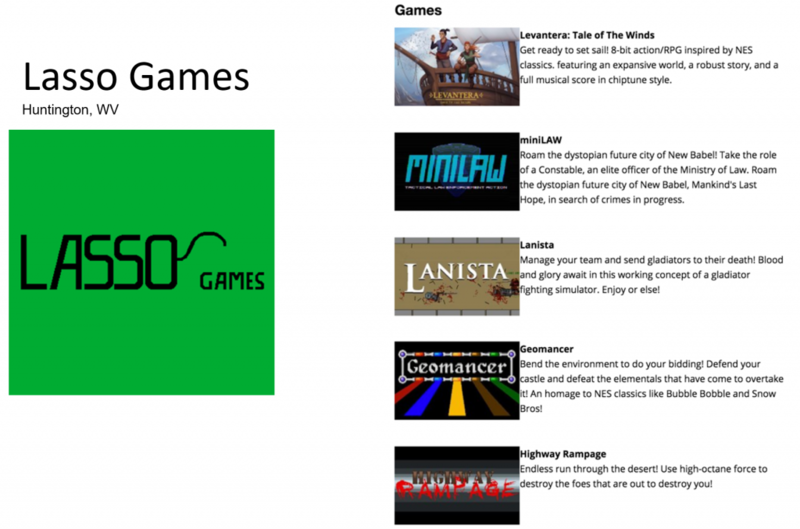 Lasso Games is based in Huntington, WV with a team of six members. As seen above, they have created five games and released them on platforms including Itch.io and Steam. Based in Huntington, WV, their current game project is Falling Embers, a 2D rogue-like game. Their founders include Alex Clay and Eric Lloyd. A demo of Falling Embers can be downloaded here. Based in Hurricane, WV, Parable Studios is working on Young Son for iOS and Android platforms and anticipates a 2018 release date. Their team includes Elliott Iannello, Jesse Lewis, and Brian Buffon. 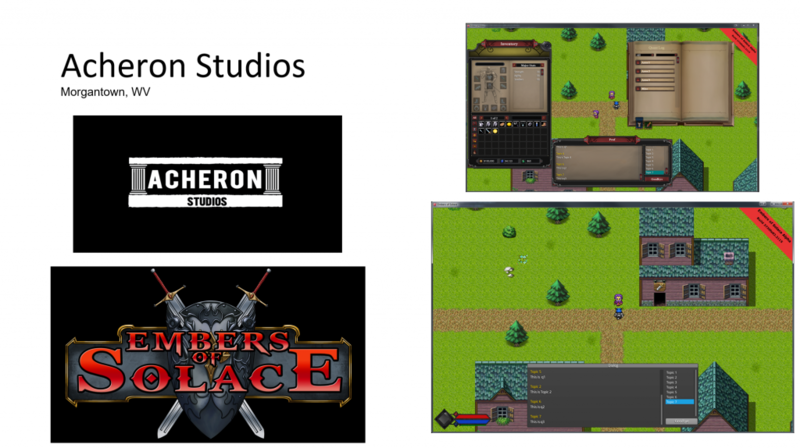 Working in Morgantown, WV, Acheron Studios is developing 2D RPG Embers of Solace. The team is being led by Barry Martin and was founded in 2014. You can play their latest game jam game Forerunner here and see more about Embers of Solace at the links below. Based in Nitro, WV, Proud Mom Games designed and developed Perspectrum, which is a 2D side-scrolling puzzle platformer. Their team includes programmer Connor Haynes, artist Gabby Dumire, composer Jonathan Harrell, and designer Kati Baker, in addition to working with Vandalia Softworks for publishing tasks. 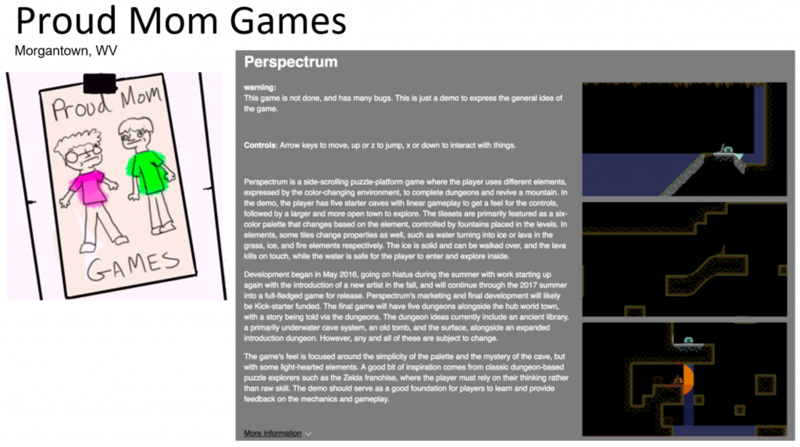 Perspectrum was released on August 8, 2018 for Windows, Mac, and Linux on Steam, Game Jolt, and Itch.io. Based in Morgantown, WV, Vandalia Softworks has three gaming projects/areas they are working on currently – those include developing forensic game-based learning software for high school and college students, working with small indie game developers in West Virginia to help them market and distribute their games in a crowded gaming industry, and working with Simgines LLC to create affordable racing computer systems for racing enthusiasts and gamers. 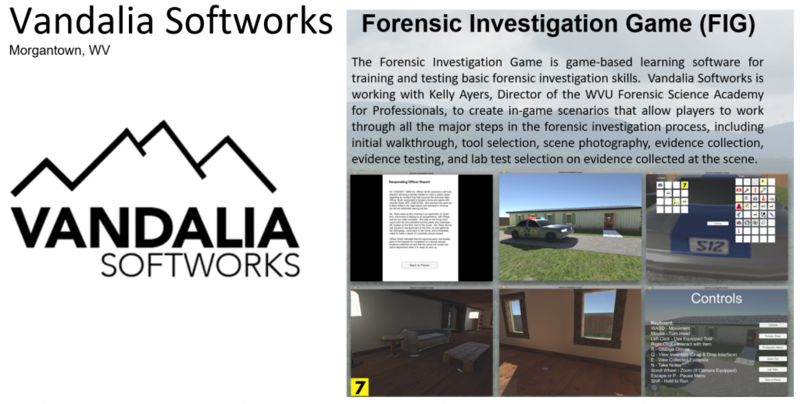 It was founded by Jordan Hallow and the Forensic Investigation Game was developed with help from lead engineer Connor Haynes, programmer Ahmed Mian, artist Jack Fechino, and subject matter expert Kelly Ayers. Based in Shepherdstown, WV, they ran a successful Kickstarter in November 2014 to raise over $25k for the development of Animal Gods. Their team includes programmer Kara Myren and designer Peter Harmon. 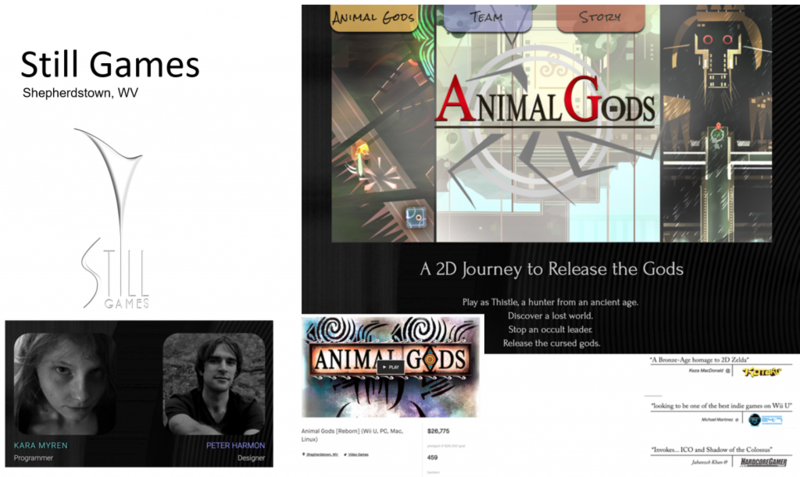 Animal Gods is available on PC, Mac, Linux, and Nintendo Wii U. 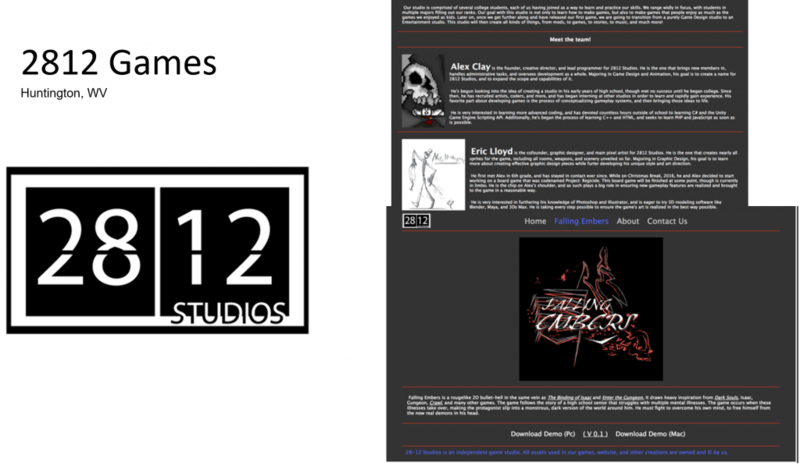 Based in Pineville, WV, Reality Games LLC is a small in-home studio founded by James Cook. 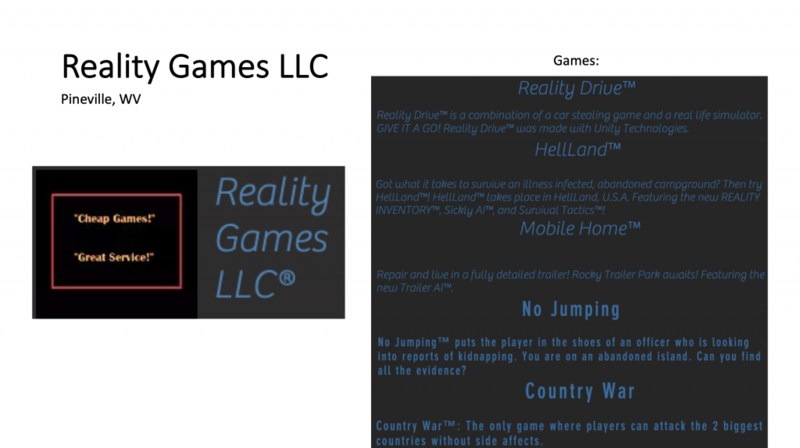 Reality Games LLC’s games are available on Windows at their website linked below, contact them for more details. This group is an official campus student organization at West Virginia University in Morgantown, WV and is also a student/academic chapter of the International Game Developers Association (IGDA). The group is for WVU students interested in game development and meets weekly to discuss the industry and organizes game jams to participate in on a monthly basis during academic semesters. You can play many of the past club-made games here. Based in Morgantown, WV, Simgines LLC, was founded in 2017 by Ethan Ball and Jordan Hallow, who were a finalist team in the 2017-18 West Virginia Collegiate Business Plan Competition. 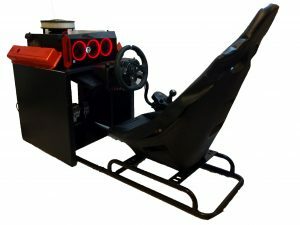 They currently sell starting sim racing hardware bundles on their website linked below and are developing a custom frame that they will be selling on their website later this year. Are you a developer in West Virginia that I didn’t mention above? If that is the case, please reach out to us by emailing team@vandsoft.com. I would like to add you to this list! 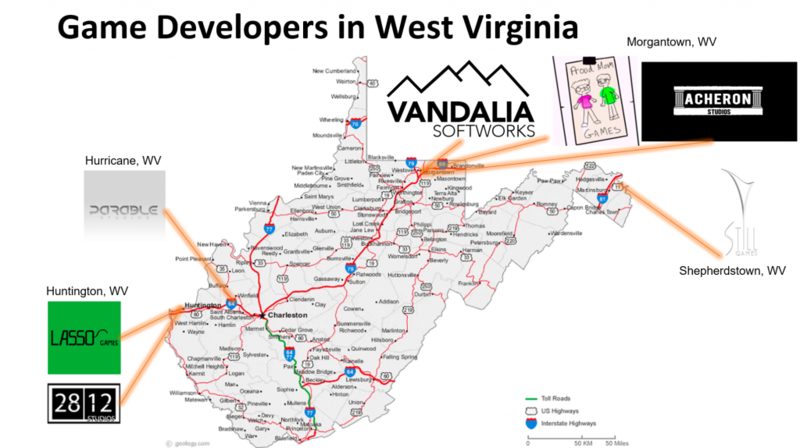 Vandalia Softworks is a game-based learning software development startup located in Morgantown, WV. Fill out the form below for our latest news and updates.